Recently I was given the opportunity to check out and upcoming new game. I received a pre-production copy of the game along with rules for play. This is my thoughts and opinions on the presented materials. Enjoy! 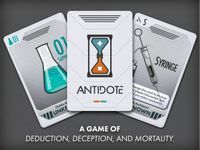 Antidote is a game by Dennis Hoyle, published by Bellwether Games. It is for 2-6 players. In this game, players will be taking on the roles of laboratory scientists who have been infected with a deadly toxin. They will be trying to share research in the hopes of finding the cure and thus saving themselves from a horrible death. The player(s) that are able to do that in time will be declared the winner and thus get to live to see another day. To begin, the 7 "X" cards will be separated from the main deck and shuffled together. One of these cards is randomly selected and set face down to the side. This is the "Antidote" card. A certain amount of syringe cards based on the amount of players are shuffled with the remaining "X" cards. A certain amount of these cards are dealt to each player, again based on the number of players. Certain amounts of number cards are then shuffled together, once more based on the amount of players. The entire deck of these cards are then dealt out, one at a time to all players. The cards that were not dealt are set aside. At this point all players should have the same amount of cards and may only look at their own cards. Play can now begin. On a player's turn, they may announce one of three actions for all player's to follow. Once the action is complete, their turn is over. The actions are discard a card, trade research and use a syringe. The first action is to discard a card. A player can announce for all players to discard a card. They must all then place a card from their hand on the table in front of them, face up if it is a number or special card and face down if it's a "X" card. This should be done simultaneously. The next action that a player may choose is to trade research. This may be done in one of two ways. First, all players may be told to pass a card from their hand to either the left or the right. Players may not look at the card until they have passed one themselves. The other way the action can be done is to announce that you wish to trade with another player. This may be discussed and terms agreed upon before doing. One player chooses who they would like to trade cards with and then just like the other way, they may not look at the new card until they have given the other player a card. The last action is to use a syringe card. These are used to steal cards from another player. To use it, the player will reveal it from their hand and then they may take either a card from another player's hand or from their face up cards in front of them, replacing the stolen card with the syringe card. This all continues until players have discarded all but one of their cards from their hand. Once this happens, each player reveals their final card. This is the formula that the player's character will drink. The face down "X" card that was set aside earlier is then revealed. This is the antidote card. If a player's card matches the antidote card, they have drank the right formula and their scientist lives. They then gain points equal to the number on their last card. However, if they chose the wrong card, their scientist drank the wrong formula and dies. The player will then lose points equal to the number on their last card. The game can then be played again, keeping track of the number of points earned each time. The player with the most points after 3 games will be declared the winner. The components for this game are simply a deck of cards. I've taken a look at the Kickstarter project to see the look for the production quality components. The cards that will be included with the game look absolutely amazing, not that the ones that I received aren't good in their own right. They are actually really nice as well. It's just that the new artwork looks outstanding. I like the cards that I played with. They definitely have a really scientific feel to them. The beakers, vials and syringes are really well done. The bright colors are really neat but it appears that they will be toned down in the final product with a more subtle gray background. This should alleviate any major confusion in trading cards. The cards are rather sturdy and look good even after repeated play. I'm really pleased with the cards for this one. The rules that I received were printed on a single double sided sheet of paper. It was in full color and everything was really easy to understand. There are several pictures and a special table describing each of the number cards in greater detail. There is also included a special rules section for a 2 player game. A very nice addition that was included. I'm pleased with the rules that were presented and I'm sure there will be an even nicer rule book included with the finished game. For what's here though, it gets the job done. No real need for anything fancy, even though a really pretty rule book makes for a nicer overall product to me at least. This game is a nice little filler game. It's not one that's going to take a long time to play. Most games will take about 15-20 minutes tops. In a lot of ways, it reminds me of Hanabi. The whole idea of not knowing which card is going to be helpful and which one won't is very prevalent here. However, unlike Hanabi, I rather liked this game, no offense to Antoine Bauza. I'm a HUGE Bauza fan, if I've never mentioned that before. This game is just more fun and not nearly as hard either. You will feel a little stressed when you start getting to those last cards in your hand and you're not sure if you're going to have the right card in your hand or not. It's those moments that are rather tense. THIS i like. The passing and trading feel a little bit like a card drafting game. Even though that's not the case, you still will get a taste of that in this one. It's these meshing of mechanics that really seem to work for me. As a matter of fact, that's what really sells me on the game. This is definitely a fun game. 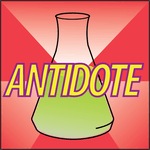 Antidote is a light card game of hand management. The way you manage your cards will determine whether you win or lose for sure with this one. I'm just glad that this is a game and not a real life or death situation because I haven't won yet. This is one of those games that like Pandemic, another great medical game that I've played numerous times, I have yet to win but have enjoyed every minute of the experience. This is truly a very fun game. It's not going to take you long to play and would be great as a precursor to the aforementioned Pandemic. It would definitely get you in the mood for it. I highly recommend this one for fans of games like Pandemic, Hanabi or any other great hand management style game. It's a great game to carry with you, as it can be played pretty much anywhere. I really like the artwork and look forward to seeing the finished project from Bellwether. This is definitely one that should be picked up. You will be pleasantly surprised by the quality of this game. For more information about this and other games, please check out Bellwether Games at their site. Also check out the Kickstarter page for Antidote and back the game. It seems that in each round only ONE player can survive and gain points, right? Also, what kind of point spread are the various antidotes worth? It seems like the game might be unbalanced if the antidote for THIS round is worth 5 points, but the antidote for next round is only worth 3 points? No. Any card matching the removed X card is an antidote and is worth the value printed on it, 1-7 (I think).